Key Chain – 1.92 oz. Key Chain – 3.72 oz. Key Chain – 3.82 oz. 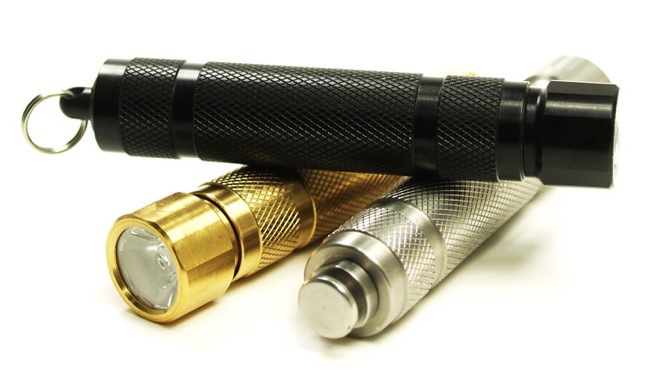 The El Capitan is a small pocket LED flashlight that uses a single AA size battery and the latest high performance LED. Peak LED flashlights deliver a powerful beam in a durable compact package that is sturdy and reliable. If you are looking for a flashlight that is easy to use, then the El Capitan is the handful of light for you. Peak lights are always at the leading edge of technology, using the latest in electronics and LEDs. The El Capitan uses Quantum Tunneling Composite (QTC) Technology for variable light output. This allows you to adjust the light output from a dim glow to the brightest single AA battery flashlight available. The QTC Technology also increases battery run times when maximum light output is not required. The special sized AA Lithium-Ion option is 14500. This makes the El Capitan the first true ultra-high performance AA battery flashlight available anywhere. A Translucent Cover that slips onto the El Capitan head to reduce output or use as an LED candle.